Inhabiting or existing in a land from the earliest times or from before the arrival of colonists; indigenous. A process in which members of one cultural group adopt the beliefs and behaviors of another group. A culturally defined category based on age used to define the life cycle, such as infant, child, teenager, young adult, adult, elderly. The attribution of a soul to plants, inanimate objects, and natural phenomena. A branch of anthropology concerned with the biological and behavioral variation of human beings, other non-human primates, and extinct hominin ancestors of the human species. A scientist interested in what it is to be human in all of our many different societies around the world today and in the past. The systematic study of the material remains of human behavior in the past. An indigenous ihabitant of a place rather than inhabitants descended from migrants or colonists; an aborigine. A group in which genealogical links to a common ancestor are assumed. A group of people thought of as a unit because they are similar in terms of social or economic factors. Where members of a society are ranked from higher to lower based on wealth, prestige, position, or education. Large-scale buying and selling of goods and services within and between societies that usually have market economies. An action or omission that constitutes an offense that may be prosecuted by the state and is punishable by law. The quality of diverse or different cultures, as opposed to monoculture, as in the global monoculture, or a homogenization of cultures, akin to cultural decay. The principle that an individual human’s beliefs and activities should be understood by others in terms of that individual’s own culture. The learned patterns of behavior and thought that help a group adapt to it’s surroundings. A kin group whose members are recruited by one of the principles of descent; e.g., matrilineal, patrilineal, etc. The movement of cultural traits and ideas from one society or ethnic group to another. The act of distinguishing differences between people and showing favoritism or prejudicial rejection of them. When humans intervene in the breeding patterns of plants or animals. The principles of conduct governing an individual or group; concerns for what is right or wrong, good or bad. A category or group of people considered to be significantly different from others in terms of cultural charcateristics such as dialect, religion, and traditions, and sometimes physical characteristics such as skin color, and body shape. The evaluation of other cultures according to preconceptions originating in the standards and customs of one’s own culture. 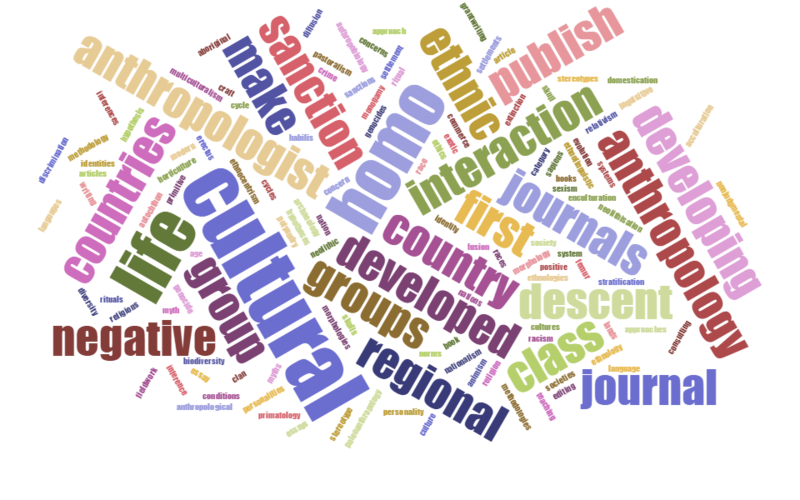 A field of linguistics that studies the relationship between language and cultural behaviour. The study of the characteristics of various peoples and the differences and relationships between them. When a culture dies out. Often the people die out too. Some may become peasants or pass into contemporary society. An indigenous American Indian community in Canada officially recognized as an administrative unit by the federal government. The act or attempt to systematically kill all members of an ethnic group or culture. An extinct species of primitive hominid with upright stature but small brain, living between 1.9 million years ago and 70,000 years ago. An extinct species of upright East African hominid having some advanced humanlike characteristics living between 2.8 and 1.5 million years ago. The set of states a person goes through from birth to death. Marriage of one woman to one man at a time. This is the most common marriage pattern around the world today. A “salad bowl” model of society in which the existence of unassimilated and partially assimilated ethnic/racial minorities is accepted and encouraged. Extreme loyalty and devotion to a nation and its interests, usually at the expense of other nations or societies. A punishment for violations of social norms. In large-scale societies, formal negative sanctions usually take the form of fines or prison sentences. In small-scale societies,informal negative sanctions are more commonly used against those whose behavior is unacceptable. Belonging to the later part of the Stone Age, when ground or polished stone weapons and implements prevailed. The world’s first historically verifiable revolution in agriculture. The scientific study of the fossil remains of extinct members of the genus Homo sapiens. The branch of agriculture concerned with the raising of livestock. It is animal husbandry: the care, tending and use of animals such as camels, goats, cattle, yaks, llamas, and sheep. . The marriage of one woman to several men at the same time. This is a rare type of polygamy. It usually takes the form of “fraternal polyandry”, which is brothers sharing the same wife. The practice or custom of having more than one wife or husband at the same time. A reward for appropriate or admirable behavior that conforms with the social norms. The gathering of data by observing behaviour such as conversations, non-verbal communication, rituals, displays of emotion –behaviour that cannot easily be expressed in terms of numbers. The gathering of data that can easily be expressed in numbers and therefore analyzed using statistical methods. The animistic religion of Asia that embrace the belief that ritual specialists can communicate with and influence supernatural beings or forces through controlled possession. A word, gesture, or object that stands for something else. Harmful prejudice, discrimination, and persecution based on presumed ethnic or racial differences. A set of attitudes, beliefs, and practices pertaining to supernatural power. A framework of bone or cartilage enclosing the brain of a vertebrate; the skeleton of a person’s or animal’s head. A fixed notion or conception of people based on their group identity. A social division in a traditional society consisting of families or communities with a common culture and dialect, typically having a recognized leader. The beliefs about the world shared by the members of a society and represented in their myths, lore, ceremonies, social conduct, and values.